This PDF 1.5 document has been generated by Microsoft® Word 2010, and has been sent on pdf-archive.com on 06/03/2013 at 02:12, from IP address 77.75.x.x. The current document download page has been viewed 759 times. File size: 1.1 MB (32 pages). Asscher Cut Engagement Ring with Pave Set Diamond Shoulders. Halo style engagement ring with outer cluster and diamond set shoulders. 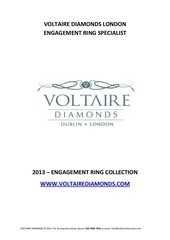 Available in all sizes from 0.5 carat upwards. Round Brilliant with Cluster Style Engagement Ring in Yellow gold with knife edge shank. split shoulders with Pave Set round brilliant diamonds. we have available for our clients. We also offer unique customized designs. This file has been shared by a user of PDF Archive. Document ID: 00096828.